We also have cell group gatherings for members (please refer the cell group webpage for meeting time and place). 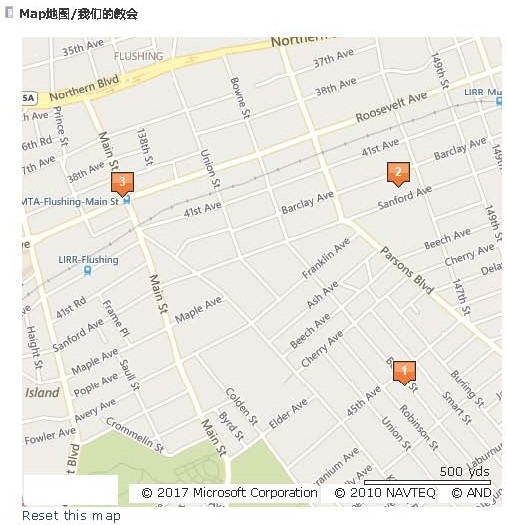 聚会地点: 143-20 45th Avenue, Flushing, NY 11355. From the Main Street/Flushing subway station, take bus #Q65 and get off at Bowne /Smart Street & 45th Avenue. It takes about more than 20 minutes walk from Main Street. 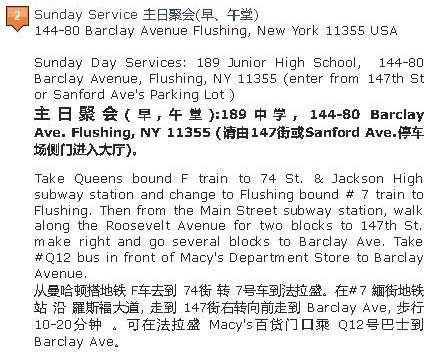 Take Queens bound F train to 74 St. & Jackson High subway station and change to Flushing bound # 7 train to Flushing. Then from the Main Street subway station, walk along the Roosevelt Avenue for two blocks to 147th St.
Make right and go several blocks to Barclay Ave.
Take #Q12 bus in front of Macy’s Department Store to Barclay Avenue. The Chinese Christian Ling Lung (Bread of Life) Worldwide Evangelical Church was founded by Rev. Shi Guang Zhao at Shanghai in 1942. Rev. Zhao later founded the Kowloon Ling Lung Church, Hong Kong Ling Lung Church, and the Bread of Life Christian Church in Taipei (Taipei Ling Lung Church) in Hong Kong and Taiwan respectively in 1950’s. 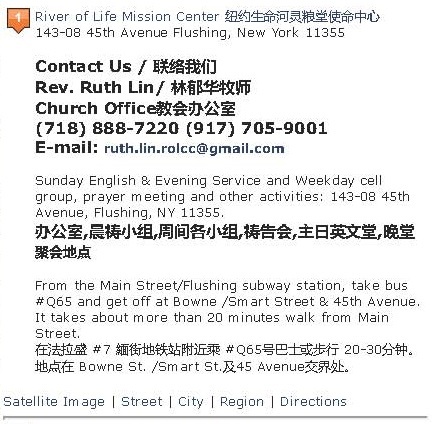 River of Life Christian Church in NY is a daughter church of River of Life Christian Church at Santa Clara, California, and the granddaughter church of Bread of Life Christian Church in Taipei. Our vision is to build a glorious church through praise and worship, Holy Spirit renewal, cell group church and glocal impact.